It’s a cruise. A cruise all the way through dazzling waters, winding Lagoons, verdant paddy fields and coconut grove. A cruise where rural charm outshjines city wonders. A cruise of breezy days, marvellous sunsets and shiny nights. It’s life felt as a cruise worth a lifetime. It’s the houseboat cruise of exhilarating experiences. Sandra House boats welcome you to the shores of Alleppey on the south-western tip of India, to embark on such an elating cruise. Large boats (kettuvallam) measuring morethan 80ft in length, once means of transports and cargo are now converted into luxuriously furnished house boats as an ideal backdrop to explore the backwaters. 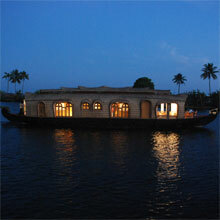 Sandra House Boat ride will take you to serene places with the typical ambience of rural charm. As the ride moves on, you can easily explore rustic life, coir villages adn abundant greenery around. Everything from a dfferent world that fulfills your dverse needs and interests. Backwaters flow to the very lif of Kerala. And Sandra House Boat ride to catch that life in full bloom. A serence life with lush, sylvan surroundings sprinkled by the hues of waters. An exciting life in harmoney with nature. With all sorts of modern facilities aboard. With the most idyllic ambience to get a close picture of idyllic Kerala. The cruise on with Sandra...and also the experiences.